If you are a wine enthusiast with a really small collection of wines, or if you maybe have a large collection preserved in a wine cellar but prefer to keep a few valuable bottles closer to you, investing in a small wine cooler might be the best thing to do. On the market, there are available a few high-quality models of 6 bottle wine coolers manufactured by various manufacturers. The characteristics and prices may vary from one brand to another, but all these wine coolers have a few things in common. Read this buyer’s guide and our 6 bottle wine cooler reviews to learn how to choose and what appliance to buy. Why Should You Buy A 6 Bottle Wine Cooler? How To Choose A 6 Bottle Wine Cooler? If you’re just a wine lover but not a connoisseur in the true meaning of the word, the main question that will arise will be: what do I need a small wine cooler for? You might think that preserving a few bottles of wine in a regular refrigerator or on a shelf in a cabinet should do it, but the things are slightly different. While you could do that, you should also be aware that you will probably ruin the characteristics of your wine, including bouquet and flavor. This might seem unimportant if you only have a few bottle of cheap wine, but if your aspiration is that of becoming a wine enthusiast, how you keep and taste your wine should be one of your main preoccupations from an early stage. Before telling you why you should buy a 6 bottle wine cooler, we’re going to tell you why you should not keep your wine in a cabinet or in the refrigerator. As you should know by now, each type of wine must be kept at a specific temperature, typically between 44 and 65°F, in order to preserve its organoleptic characteristics. However, the temperature should not be your only concern. To preserve a wine, as important as the temperature is the constant level of humidity, that should be around 65-80%. For these reasons, you can already understand that a refrigerator or cabinet cannot reproduce the ideal conditions needed to preserve the wine. The temperature inside a refrigerator is typically below 40°F, while in your home the temperature might not be constant at all times. The humidity level most likely will not meet the desired parameters either. So, if you have only a couple of bottles to preserve, the most logical solution is to invest in a 6 bottle wine cooler. Don’t worry, these units generally have affordable prices and compact dimensions, so you can place them virtually anywhere in your home, from the kitchen countertop to a shelf or table in your living room or office. 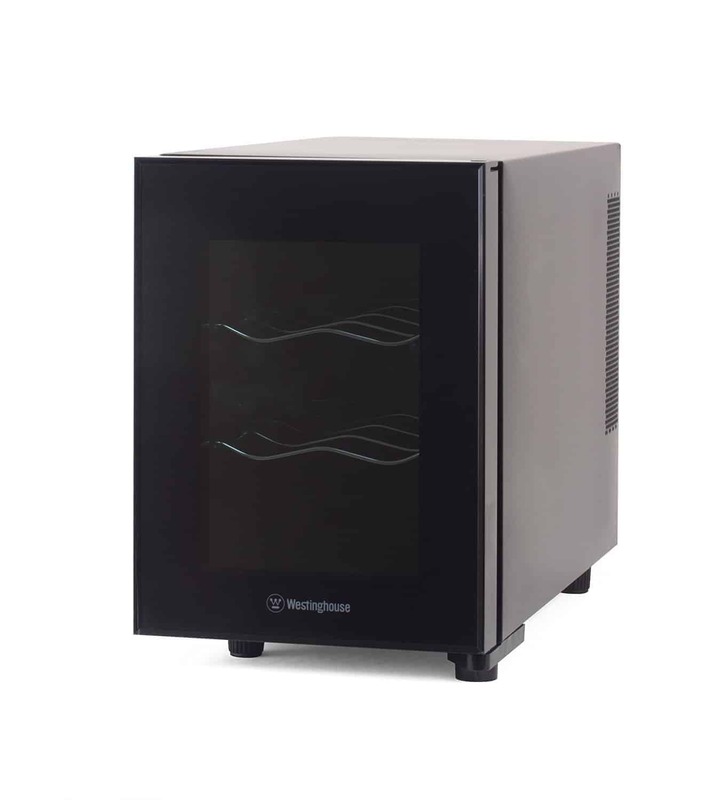 When you decide to buy a 6 bottle wine cooler, the first thing you will discover is that almost all units use a thermoelectric cooling system. This means that you will not have to worry about noise or vibrations, but you will probably not be able to integrate the appliance in your furniture if you want to. So the first thing to consider is where you want to place the wine cooler, keeping in mind that you have to leave some free space around it to ensure a proper air flow. Removable shelves: virtually all wine coolers available on the market have their capacity established based on standard Bordeaux type bottles. If you want to store larger bottles, such as bottles of Pinot Noir or champagne, you will probably have to remove some of the shelves. Internal light: if you want to admire your collection without the need to open the door, a soft internal light will prove to be very useful. Locking door: this might not be important in some cases, but if you have some really expensive bottles of wine, you might want to keep them away from any unauthorized access. Celsius/Fahrenheit display: this is really important if you have a collection of foreign wines that have the label written in a different metric unit. 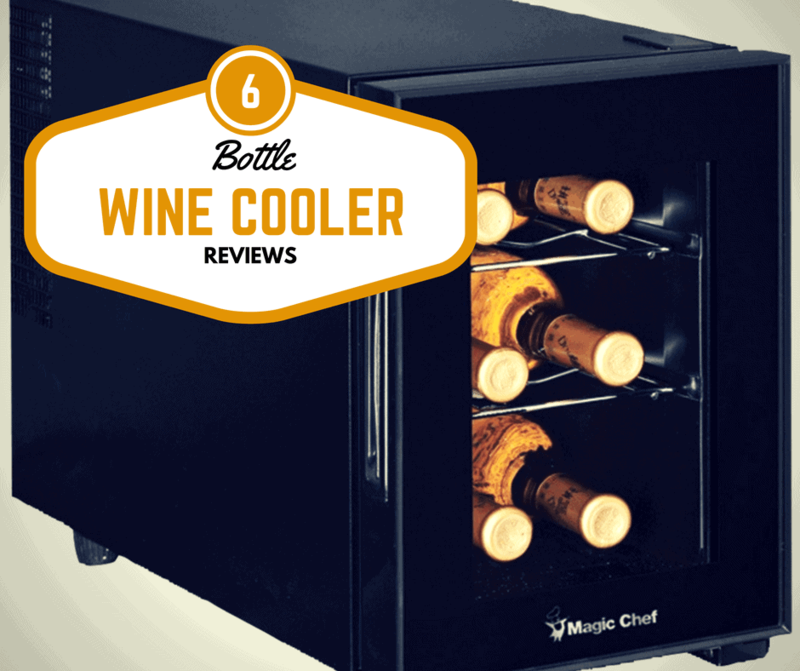 Now, let’s see our 6 bottle wine cooler reviews to decide which unit to buy. An elegant and popular 6 bottle wine cooler is this Westinghouse WWT060MB, a unit equipped with a soft internal light and with two chrome storage shelves that are removable. Ideal for white or red wines, this unit has a wide temperature range that varies between 46 and 66 degrees Fahrenheit. 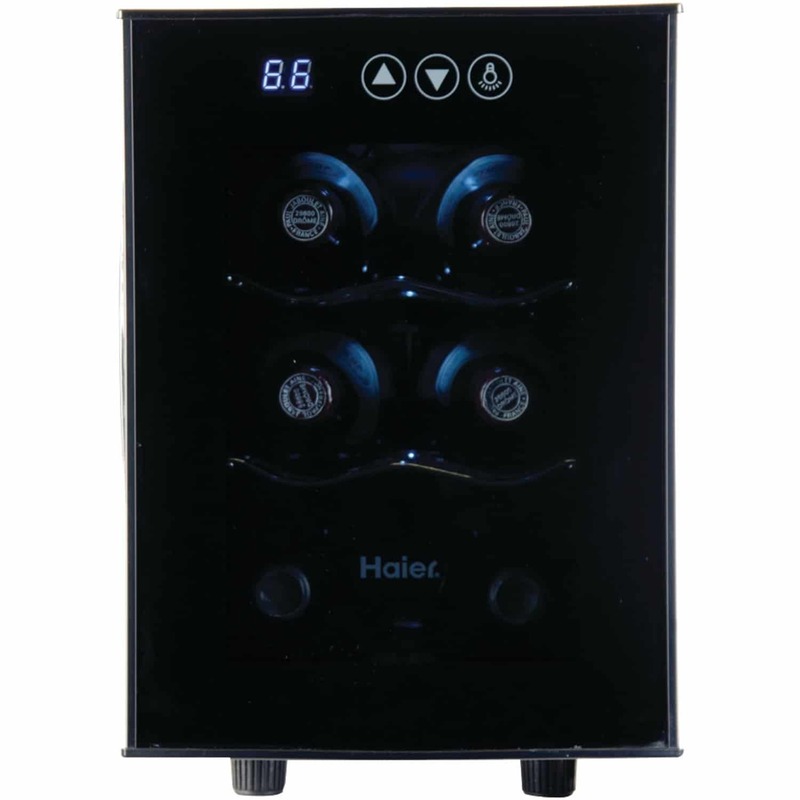 Using the thermoelectric technology, this unit is very quiet and has a very low level of vibrations, being able to preserve your wine in the best conditions. Mechanical temperature control: you will be able to set the desired temperature easily, by simply using a convenient knob. Chrome shelves: to enhance the sleek design of the unit, the manufacturer equipped it with chrome shelves. Dark glass door: you will be able to keep your wines safe from the light and admire your collection thanks to the dark see-through glass door. If you want to check the temperature, you will have to use a separate thermometer. 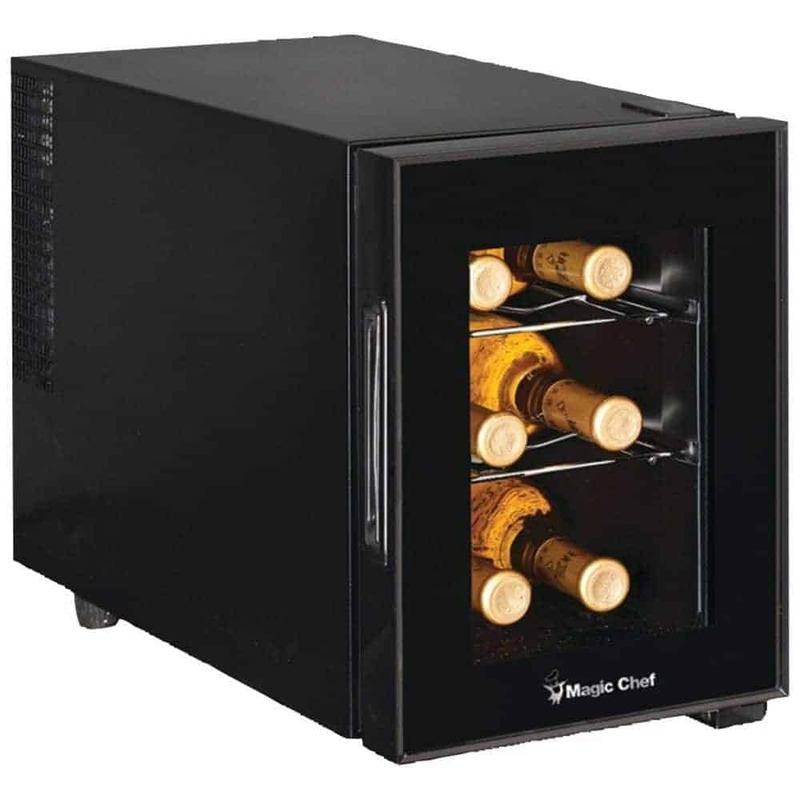 The Magic Chef MCWC6B is another compact wine cooler that impresses with its sleek and modern design. Ideal as a countertop wine cooler, this unit can also be placed anywhere else in the house. This unit boasts three removable chrome shelves that will allow you to easily change the internal configuration, while the quiet operation is ensured by the thermoelectric technology. The Magic Chef also has adjustable legs, so you will be able to adjust the unit’s position on uneven surfaces with ease. Internal light: you will be able to admire your collection at any time thanks to the convenient internal light. Adjustable temperature: this unit has a temperature range between 46 and 64°F. Beautiful design: this unit can be used in both a modern or a classic interior, thanks to its beautiful black cabinet. If you need to maintain low temperatures, the unit is quite noisy. If you want to add a stylish touch to your interior and preserve your wines in a really sleek wine cooler, then Haier Wine Cellar might be an excellent choice. This unit is equipped with a soft blue internal light and with digital temperature controls. The wine cooler is also equipped with an integrated thermostat that will let you check the internal temperature at any moment. Wide temperature range: the unit has a temperature range that varies between 46 and 66°F. Curved door: the manufacturer equipped this unit with an elegant curved smoked glass door. Fits larger bottles: if you have to preserve larger bottles of wine, they usually fit fine inside this cooler without problems. The fan is pretty noisy, so keep this in mind if you want to place it in a living area. Another excellent option for a 6 bottle wine cooler is this Vinotemp VT-6TSBM, a compact wine cooler equipped with two removable chrome shelves. This wine cooler is also equipped with digital temperature and light controls, so you will find it really easy to set the desired temperature or admire your wines. When it comes to the design, the mirror effect of the glass door is nice, and the unit will probably fit well as a countertop cooler in the kitchen. Celsius/Fahrenheit temperature display: you will be able to choose your favorite metric unit to display the temperature. Double-panned glass door: will keep your bottles away from the UV light. For red and white wines: the temperature ranges from 46 to 65°F. This unit is appropriate to be placed in the kitchen but it probably wouldn’t look that good in a living area. 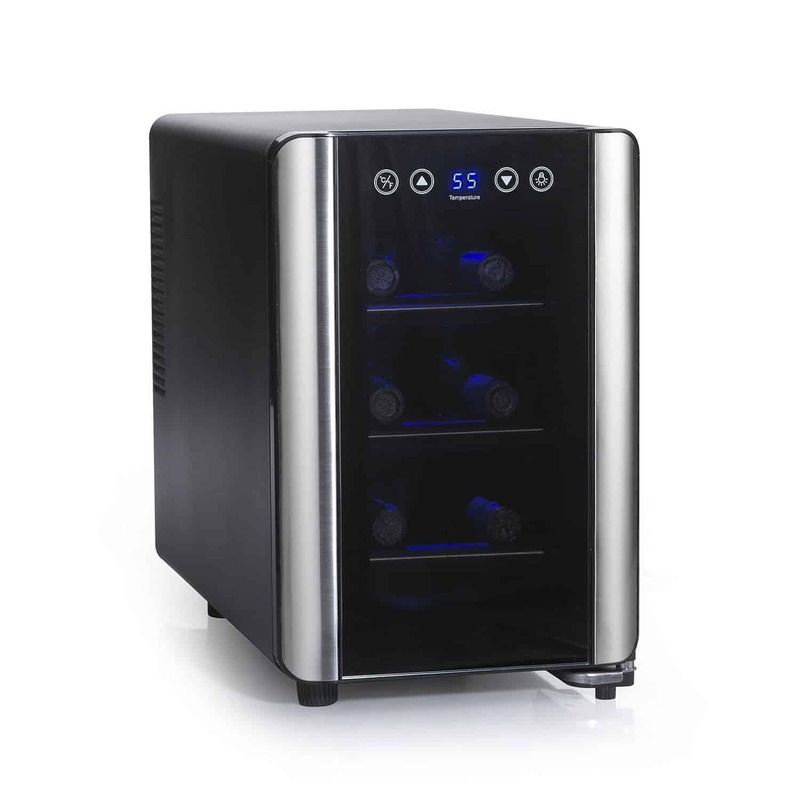 The last 6 bottle wine cooler reviewed is this Wine Enthusiast 272 03 07 that features a touchscreen control and a soft blue internal light. The modern design is simply beautiful and the reflective smoked glass door will maintain your wines safe from the UV light. Adjustable temperature: the temperature ranges from 46 to 66°F. Beautiful chrome details: with a sleek and modern design, the unit can be placed anywhere in the house. Three removable shelves: if you want to preserve large bottles, you can simply remove one or more shelves. Although there are many choices, when it comes to choosing the best 6 bottle wine cooler, our favorite is the Haier 6-Bottle Wine Cellar. 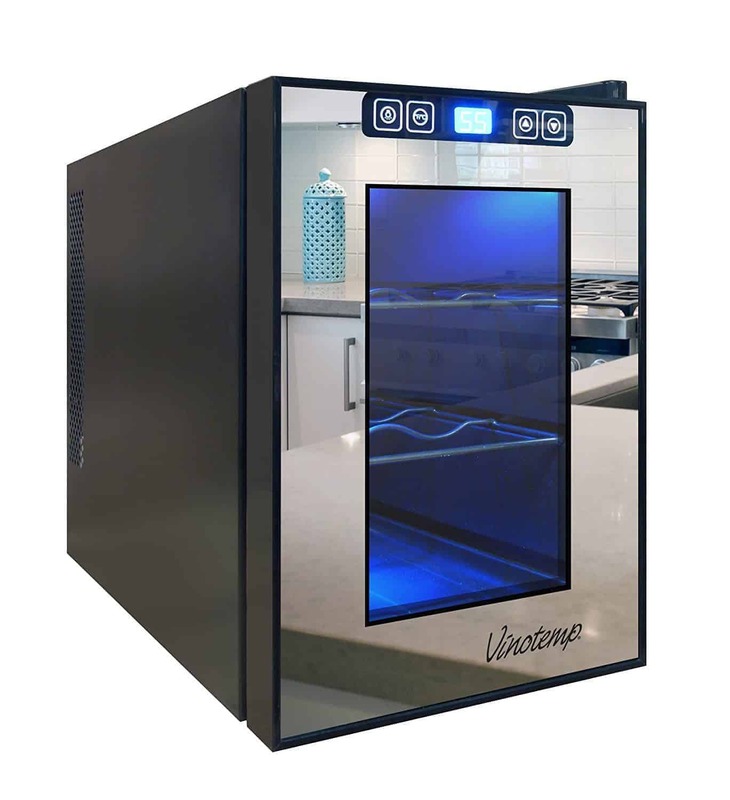 This unit has a really beautiful design, it can accommodate even larger bottles and the digital controls will let you not only set the temperature but also check it at any time. If you need more space the shelves are removable, and the manufacturer also manufactures this wine cooler with various capacities. For these reasons, this is the best 6 bottle wine cooler available on the market.